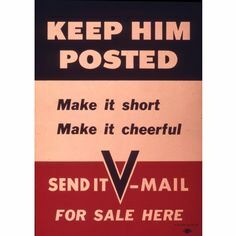 I found some V-Mail for sale on ebay and wasn't sure what to get, but I came across several lots of letters from the same woman from Lima, OH, who was a prolific writer. I think she may have written her husband every day he was gone, and sometimes twice in one day. I obtained quite a few of them - V-Mail microfilm prints, and some originals. I'm sad I didn't get them all, but there were a lot! 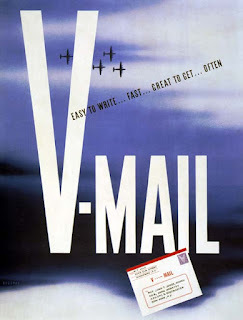 It's amazing these letters were all saved, and even more amazing her family let them go. I did a little research and she only died about 10 years ago. 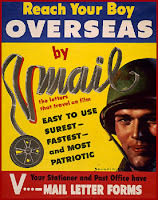 Her letters are sweet, chatty, full of the mundane, but so full of wonderful wartime details. They are such a treasure, and I feel so blessed to have them to study and preserve! 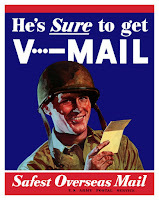 Below are three examples of V-Mail that I got. Two are the prints made from the microfilm negative. The red one is the original V-Mail form onto which the sender wrote or typed their letter. Here are some close-ups of the microfilm negative prints: The print is pretty tiny and you could get a special magnifier with which to read your letters. Click on the images to see them in a larger size. The front. The envelope and letter are in one. The envelope, or outside, opens up with the letter inside. Here you can see the type underneath. Scanned copy of the letter. I found this letter to be perfect! She talks about the magnifier used to read V-Mail, and other great V-Mail and wartime details. 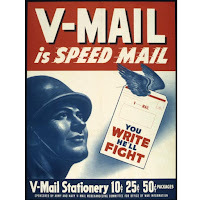 The National WWII Museum in New Orleans has a fabulous website with information about V-Mail. You can check out the link here to learn more. This is so fascinating! And I hadn't ever heard of it before your discovery. Thank you for sharing. Your welcome! I was so thrilled when I discovered it and just ate up whatever information I could find. It's such a neat detail about the war that you don't hear very much about.